October 7, 2017: Midnight Matinee: Good Buy, Columbus! 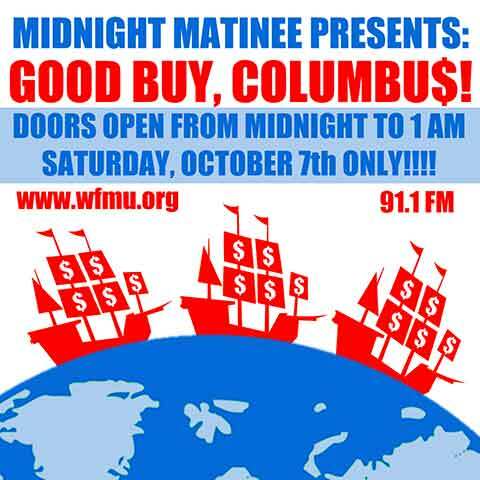 At the stroke of midnight October 6/7, as Friday turns to Saturday, Midnight Matinee presents a special, one-hour only sales event, Good Buy, Columbus! Huge savings on our entire inventory, everything must go. A celebration of Columbus and consumerism for your listening pleasure. Host John Schnall will entertain your ears while rotting your mind. I love the title "Hirsute Clay-worker"
I see some titles will be a tad chopped/ I will fill in any full title names if requested. In this case: Risky Advertising Purchases In a Non-standing Toddler. THE chris marker? la jetee? did i hear that right? good morning john, scraps, jdream, ian, et al. Good morning Rich! Are you ready for a shopping experience unlike any other? Today only! Oh, I see this is an interactive game... The second song in the set is called Positive Shopping Experience, New World Explorer. And I blame Steve Jobs for any truncation of song titles on your CD. aaah! to sail the trunc elipsis . . . those were the days laddie. there there be monsters and here be we. ...humans. i'd rather takes me chances along the edges. Mom's pretty attractive too, Carmichael. do you guys know dan bell dead malls on youtube? perfect viewing for this. I like just sorta staring at the playlist for an hour; Rich has masterfully matched the background color to the ships at sea, I could stare at that all night. And I will. That’s where I get my good looks. My uncle used to have a 70s-era Mercury Capri (imported from Europe) that was about this color. Maybe a little more orange, come to think of it. Good Evening, Rich & Fellow Shoppers! Loved the Gremlins remix! Lol! But, its after midnight...Uh Oh! I like how some places have their "Columbus Week" stuff on for sale for half a month. A week before and a week after Columbus Day. Thinking of which, the Christmas displays are due right about now. I guess it's like nudists who wear a bow on Xmas; even a little glitter makes them feel dressed. Poor sidewalks. Take the oath, join the adventure. Take the bow, join the convention. Thanks, John. Whatever you do, don't stop spending! All Hail Vincent Price! Dr. Phibes Lives! In this show it's Vincent Half-Price, today only. 24 hour Psycho sounds intriguing. It probably takes Norman an hour to find the keys to the room. Thanks for the Midnight Matinee, John! Some serious fun! The music is AMAZING. Thanks Rich! you're welcome grtyvr. do you pronounce it gertiever or griteever? thanks for listening everyone. have a good week. help us out during this fundraiser if you can. stay tuned for carol.